Killed In Action 25th April 1915. Husband of Lavinia Cant of 63, Brandwood St, Bolton. Charles William Cant was born in 1881 and baptized on the 9th March 1882 at St James Norlands, Kensington. He was the youngest son of John and Mary nee McCarthy. His father was a zinc worker and Charles was one of at least five children. On the 1881 census the family are residing at 18, St Catherine Road, Kensington. Charles and his brother Joseph were admitted to the workhouse infirmary on the 11th of October 1887 having been passed from Camberwell Union. Charles was admitted to Beechholme on the 23rd of December 1887 where his next of kin was given as his mother Mary of 56,Elm Street, Camberwell. Charles' father died in 1890 at the age of 36. Charles was discharged from the school on the 9th of June 1896 to the 1st Royal Munster Fusiliers at Curragh Camp, Ireland.
. Charles' mother cannot be found on the 1891 census but she is still alive as in 1901 she is lodging in a public house, but then dies 2 years later. Charles himself cannot be found on the 1901 census but by 1911 he is a Band Sergeant with the 1st Royal Munster Fusiliers in Nowshera, Punjab, India. His place of birth is given as Brighton which is incorrect. He was married in the interim period and his wife is called Lavinia but there appears to be no trace of this marriage. There is a child born to them in India in 1906 at Rawalpindi and this birth is registered under army births. Two of his brothers also served in the British Army, both in India, but both were discharged as being medically unfit before the outbreak of war . On their attestation papers both are described as being small and under-nourished. Also from their service records it is clear that they have no idea of the whereabouts of their mother. The 1st Royal Munster Fusiliers sailed for the Dardanelles, Turkey as part of the 86th Brigade of the 29th Division. The object of the landing was to open up the Dardanelle Strait in the battle for Gallipoli, to enable the allied relief convoys to reach Russia. The 1st Munsters sailed on the SS River Clyde, a converted collier with the capacity for over 2,000 men, and they arrived on the 25th April 1915 with the 1st Royal Dublin Fusiliers and some companies of the Royal Hampshires. The ship ran gently ashore, its exit bows facing the beach for what was to be the grossly mismanaged British 'V' Beach landing at Cape Helles. Small boats first carried companies of Dubliners to the beach, where four hidden Turkish gun ports opened fire and decimated them. A postscript to the tragedy was that six of the River Clyde's crew were awarded the Victoria Cross for their bravery in recovering the wounded men. Charles' wife was his sole legatee and she had the following inscription added to his gravestone " Duty Nobly Done". SOURCES :- Ancestry.co.uk, Find My Past, CWGC, Extract from "Gallipoli" by Robert R.James published 1965, Wikepedia. Killed In Action on the 4th October 1917 aged 22. Son of Mr. and Mrs. Chalcroft , late of Chilton Road, Leatherhead, Surrey. Walter Chalcroft was born in the December quarter of 1895 in the picturesque village of Mickleham which lies between Leatherhead and Dorking. He was the middle of three children born to Walter and Martha nee Saunders. Walter’s mother died in 1900 and on the 1901 census the family are living at Yarn Court Cottages, Leatherhead; Walter senior is employed as a general labourer. Walter is aged five and he has an older sister Olive who is seven and a younger one called Susan who is aged three. Ten years later Walter is aged 14 and a resident of Beechholme School. His admission date to Beechholme is unknown. Both his sisters are living in Dudley, one employed as a domestic servant and the younger one in training for the same. Walter’s father has since re-married and is living in Kingston with his new wife and four children. There are no surviving service records for Walter. His medal index card reveals that he originally enlisted into the Kings Shropshire Light Infantry at some point after 1915 as he was not entitled to the 1914/15 Star. It was common practice for soldiers to be deployed to another regiment either because of severe losses or because the soldier was wounded and sent to another regiment on his recovery. This happened to Walter twice, as his last regiment is shown to be the Royal Warwickshire. The 14th Royal Warwickshire regiment as part of the 5th Division, took part in the Battle of Broodseinde a phase of the Third Ypres Campaign. This took place near Ypres in Flanders at the east end of the Gheluvelt plateau and involved the British 2nd and 5th Armies and the German 4th Army. The casualties were :- Officers killed 1, wounded 5. Other Ranks killed 24, wounded 96, missing 3. On the bottom of Walter’s medal index card it gives his next of kin as his sister Olive. Her original address of Dudley has been deleted and an address in Yarra, Melbourne given. His two sisters were the legatees. Tyne Cot Memorial, West Vlaanderen, Belgium. Wikepedia, Commonwealth War Graves Commission. Killed in Action 27th August 1914. Addie was born, according to Poor Law records, in 1879 in the borough of Kensington and Chelsea. No birth record exists for anyone of this name and there is no trace of him on the 1881 census. The Poor Law records state that his parents were unknown and that Addie was adopted. He was admitted to Beechholme on the 5th of September 1884. By 1891 he is a resident of Beechholme aged 11 and his surname then is given as Cogger, on all other records it is given as Codger. His date of sending out from the school was the 19th of September 1895 to the 2nd Royal Dublin Fusiliers at Plymouth. An annual report on the 12th of August 1896 states " Sailed 16th February 1896 to join the second battalion at Bombay. Good conduct reported." He has no next of kin and a declaration regarding there being no family is signed by one Frank Wellman of 5 Pound Cottages, Pound Road, Banstead who is listed as a friend. This form was signed at the Kensington and Chelsea School, Banstead. On enlistment he was given as being 14 years and 11 months old and 4 feet 9 ½ inches in height. Addie was awarded two South African medals and one Good Conduct medal and took part in the relief of Ladysmith. His conduct was exemplary and he rose through the ranks from Bandsman to Lance Corporal. The 2nd Royal Dublin Fusiliers landed at Boulogne on the 22nd August 1914. The battle of Le Cateau was fought on the 26th August 1914 after the British and French retreat from Mons. Le Cateau is a small town situated some 27 kilometres east-south-east of Cambrai in the Nord region of France. The battle itself was an artilleryman's battle and demonstrated the devastating results which modern quick firing artillery using air bursting shrapnel shells could have on the advancing infantry. A quote by John Lucy of the 2nd Royal Irish Rifles in his book ' There's a Devil in the Drum'-"It is said by some that throughout the entire course of the war never were British troops as heavily outnumbered as at Le Cateau". By the 25th August 1914 the German Army was close on the heels of the II Corps of the British Expeditionary Force and there was a danger that the retreating British troops, now exhausted and in some disarray, would be overrun and defeated if the withdrawal continued. By nightfall General Smith-Dorrien had decided that II Corps along with a detachment of French Cavalry would stand and face the advancing German forces at Le Cateau. Shortly after dawn broke on the 26th August German artillery batteries located about 3 miles to the north east began firing on the British troops who were still taking up their positions to the west of the town. As the first shells landed, German cavalry appeared from the direction of Cambrai and began advancing towards the British line of defence. For the next six hours British and French troops laid down rifle and artillery fire and despite suffering heavy casualties, managed to hold a greatly superior German force at bay. By mid-day more German units were entering the battlefield, enemy artillery fire was becoming more intense and it was clear that the Allied Forces, numbering about 40,000 men would have to retreat or prepare to surrender. Soon after 1.00pm British artillery units, some of which had been stationed alongside the infantry in the front line, began to slowly withdraw from the battlefield. Fierce fighting continued for the rest of the day and some British units were almost completely wiped out. By sunset most Allied soldiers had successfully withdrawn. Of the 40,000 Allied forces fighting at Le Cateau 7,812 were killed, wounded or taken prisoner. One of those killed was Addie Codger. He had exactly four days on French soil. His service records show that he was originally listed as missing, but this was later revised as killed in action on or about the 27th August 1914. Son of Mrs Jane Couchman of 11, Shorrold's Rd, Fulham. Richard Couchman, the fifth child of seven, was baptized on the 15th September 1886 at Christ Church St Marylebone. He had been born in Paddington to Henry and Jane nee Swan. His father was a licensed victualler. In 1891 the family are living at the Old King's Head, Tooley Street, Southwark and it is Richard's mother who is now listed as being the publican. Henry has no occupation listed and as he dies in 1893 perhaps was unwell and no longer able to work. The next census in 1901 finds Richard a resident of Beechholme age 13 having been admitted on the 2nd of May 1894. He is the only one of the children seemingly to be in the school as his three sisters have remained with their mother who is employed as a domestic. The older siblings are living away from home. Poor Law records give Richard's mother Jane as his next of kin. Her address was 6, Shalcomb Street. Richard was discharged from the school on the 1st of August 1902 to the band of the 1st Manchester regiment. By 1911 Richard is serving with the 1st Manchester Regiment as a Bandsman. The regiment is in Pachmari in India. He is aged twenty-two. On the 4th August 1914 the regiment were stationed at Dalhousie, Amritrar and Jullunder as part of the 3rd Lahore Division. On the 29th August they sailed from Karachi for Europe on the " Edavana" arriving at Marseilles on the 26th September 1914. On the 26th of October they relieved the Bedfordshire Regiment at Festubert and here they suffered their first casualties. After a period in and out of the trenches they marched to Gorre and took part in the attack on the village of Givenchy which was in German hands. The Manchesters attacked at 3.00pm and hand to hand fighting ensued. The village was taken back house by house. Through fierce fighting the Manchesters held the line long enough for reinforcements to be brought up and they were described as "the Gallant Manchesters" by General Watkis. In March 1915 orders were received for the attack on Neuve Chapelle. This attack was an entirely British affair although at the suggestion of the French under Commander-in-Chief General Joffre. The French stated that until extra British Divisions could relieve them at Ypres they had insufficient troops in the area to support the action. The objective was to take advantage of the growing numbers and strength on the Western Front and to relieve German pressure on Russia, and if possible break through in France. Neuve Chapelle village lies on the road between Bethune, Fleurbaix and Armentieres near its junction with the Estaires-La Bassee Road. The night before the attack was wet with light snow which turned to damp mist on the 10th March 1915. The battle opened with a thirty-five minute bombardment of the front line, then another thirty minutes on the village and reserve positions. The bombardment for weight of shell fired for yard of enemy front was the heaviest that would be fired until 1917. Three infantry brigades were ordered to advance quickly as soon as the barrage lifted. From the front line at 8.05 am the 25th and 23rd Brigades of the 8th Division made good progress against the village. There were delays in sending further orders and reinforcements forward, but by nightfall the village had been captured. During the night the Germans reinforced their second line and all further attempts over the next few days brought little material success. British losses in the four attacking divisions were 544 officers and 11,108 other ranks killed, wounded or missing. The British had succeeded in recapturing just over 1.2 miles of lost ground. Lessons learnt from Neuve Chapelle were that the main artillery bombardment was too light to suppress the enemy defences, there were too few good artillery observation points, the reserves were too few to follow up success quickly, command communications took too long and the means of communicating were too vulnerable. Soldiers Effects records held by Ancestry note that Richard died at No. 26 British Field Ambulance. His sole legatee was his mother Jane who had the following inscription put on his gravestone, " Gone but not forgotten, Mother." Grave Ref :- III .C.13, Estaires Communal Cemetery and Extension Nord, France. This casualty has been difficult to identify with certainity although we believe we have the right man. If you have any further information, please do contact us. Thomas Cowen’s birth was registered in the last quarter of 1885 and he was baptized on the 9th of November that year at St. James, Norlands. He was the fourth child of at least six born to William and Martha nee Rankey. The family were living at 26, Princes Road at this time. Two children died in infancy. Thomas’s father was employed as a coach and bath chair maker. When the 1891 census was taken the family were living at 7, Borne Road, Kensington. Thomas was admitted to Beechholme on the 9th of June 1994 and was seemingly the only child from this family to be admitted there. His next of kin was given as his mother Martha of 78, Princes Road and his father was dead. Thomas was aged twenty one at this time. There is no further information about him. No military records or death entries match for this man. Despite extensive searching we have been unable to locate him after 1906 and as such he remains a mystery. NB. The Panel spells his surname Cowan and reports him being in the 20th Hussars. Brother of Arthur c/o Tenby Cottage, South Ascot, Berkshire. Percy Craddock was born in the April quarter of 1891 in Paddington. He was actually baptised William Percy Craddock on the 23rd of October 1894 on the same day as his younger brother Edwin Arthur. This baptism took place at St James, Norlands. Both of these children are later known by their middle names. Percy was one of five children born to Edward Craddock a cab driver, and Kate nee Barker, and he was probably the oldest. When the 1891 census was taken the family were living at 28, Woodfield Place, Paddington, and this was shared accommodation with one other family. William is an infant and there is one older sibling by eleven years who was probably from a previous marriage. Between 1892 and 1898 four more children are born, one dying in infancy. 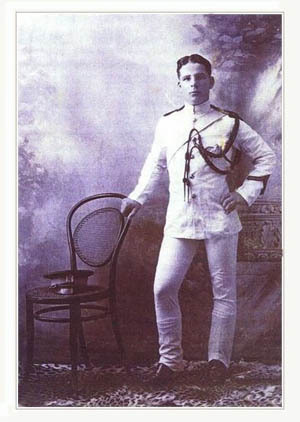 The surname is often recorded as Craddick, but on his baptismal record, and on his Australian military records Percy’s name is given as Craddock. In 1900 tragedy struck the family, Percy’s father died in the Kensington Infirmary at the age of 46 or thereabouts. On the 17th of May 1901 Percy was admitted to Beechholme. The Poor Law records initially record his next of kin as being his mother Kate, a widow, but then note that she died later that same year. The children were now split up, Percy being placed in the Kensington and Chelsea District Branch School in King Street London. Percy's siblings would all be admitted to Beechholme after initial assessments carried out at the branch school. Percy was a resident of the school for six years. A report written in 1908 when Percy was fifteen states " Tailor's apprentice. Situation and residence c/o Mr F.H. Robinson, High Street, Linton. This lad's character is excellent. He is perfectly happy and his employer speaks well of him to the clergyman who visits him. He has joined the Church Lad's Brigade and attends church regularly and goes to Holy Communion." On the 1911 census Percy, at the age of twenty-two and described as a tailor maker, a trade he would have learnt while in the children’s home, is boarding in Frome Somerset. Exactly when Percy emigrated to Australia is unknown but from his Australian service records he enlisted on May 7th 1915 at Bridgetown, Western Australia. He is described as being 5 feet 7 and ¾ inches in height and weighing 101 lbs. He had a dark complexion with dark brown hair and grey eyes. He had a skull tattoo on his left arm. His occupation was given as tailor and his brother Arthur of 33, Kensington Park Road in Notting Hill is listed as his next of kin. It gives Percy’s place of birth as Kensington, London and his age as 24. He is ascribed the Christian name of Percival on all his records, perhaps they assumed that Percy is always a shortened version of Percival. Percy embarked with the 16th Australian Imperial Force on HM Chilka on the 18th of June 1915 from Freemantle to Gallipoli. He was taken on strength with the 16th battalion on the 2nd of August 1915. The 16th battalion was raised from 16th September 1914, six weeks after the outbreak of war. Three quarters of the battalion were recruited in Western Australia. From May to August the battalion was heavily involved in establishing and defending the front line of the Anzac beachhead and the attack on Hill 971. The hill was taken at great cost, although Turkish reinforcements forced the Australians to withdraw. The battalion served at Anzac until the evacuation in December 1915. After the withdrawal from Gallipoli the battalion returned to Egypt and while there the Australian Imperial Force expanded and was reorganised. The 16th battalion was split and provided experienced soldiers for the 48th battalion. The 4th brigade was combined with the 12th and 13th brigades to form the 4th Australian Division. Percy’s service records show that he sustained an injury to his left elbow from which he was hospitalised briefly at West Mudros from the 29th of September 1915 until the 1st of October when he was discharged to duty. Perhaps the injury hadn’t healed properly or got re-infected but Percy was re-admitted to the 2nd Field Hospital with a septic sore on the same elbow. This time he was in hospital for almost two months before being discharged. Percy was promoted to the rank of Lance Corporal on the 25th of May 1916. In June 1916 the regiment sailed for France and the Western Front. They took part in bloody trench warfare and the first major action in France was at Pozieres in the Somme Valley. Mouquet Farm was located about 1.7 kilometres north west of the high ground of Pozieres and following the fighting that had taken place around the village earlier in the year, the decision was made to gain control of the ridge beyond the village in order to create a gap in the German lines, behind the salient that had developed around the German-held fortress of Thiepval. The battle commenced at the beginning of August and continued on into September. During the battle the three Australian divisions advanced north west along the Pozieres ridge towards the German stronghold of Mouquet Farm, with British divisions supporting on the left. The approach to the farm, was under observation from German artillery spotters who were able to call down barrages on the attackers from three sides of the salient that had developed in the lines. This resulted in heavy casualties before the farm was reached. From the Australian Red Cross Society Wounded and Missing Files are various statements and eye witness accounts regarding the fate of Percy Craddock. Percy was seen lying behind Mouquet Farm where he was brought in by stretcher bearers badly wounded in the shoulder with the shoulder being part blown away. He died shortly after. Percy may well have been buried initially but with the constant fighting at Mouquet Farm the grave site may have been lost, hence why he is commemorated on a memorial. The only item belonging to him that was retrieved was his identity disc. His sister Florence was the sole beneficiary of Percy’s will, but her whereabouts were seemingly unknown as letters in the service records reveal the search for her. In the event of her death the estate would be shared equally between Arthur and the other brother Edward. Percy’s brother Arthur as next of kin is now residing at c/o Tenby House, Ascot, Berkshire. GRAVE REF :- VILLERS-BRETONNEUX MEMORIAL, SOMME. 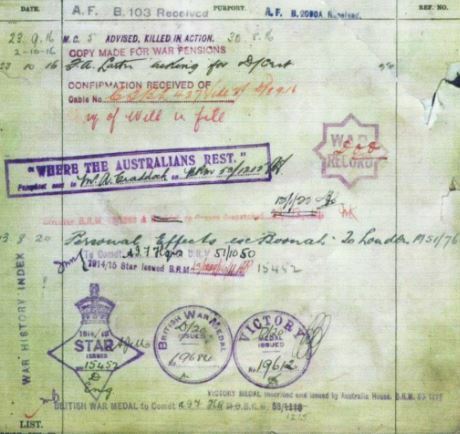 Above is part of the Australian service records showing how they differ from our own. They also show the medals that Percy would have been entitled to, which would have been sent to his brother. Roll Of Honour of Australia in the Memorial War Museum, Wikepedia. Killed In Action on the 17th February 1915 . Foster son of Annie Shortman of “Minerva”, Benhill Avenue, Sutton, Surrey. Godfrey was born around 1894, probably within the borough of Kensington and Chelsea. In 1901 Godfrey is described as being a pauper scholar aged 7 and is a resident of Beechholme. He was admitted on the 30th of September 1898 via the workhouse infirmary. His previous address was given as 98, North Street. Poor Law records state that Godfrey's mother's name was Elizabeth and that she had deserted him. Her whereabouts were unknown. Ten years later he is aged sixteen and employed as a bootmaker and is living with his employer at Church Street, Esher. From “Soldiers Died in the Great War” Godfrey enlisted in Warley, Essex and was living in Claygate at the time. He was an early enlister as according to his medal index card his date of entry was the 22nd of August 1914. He was therefore entitled to three war medals known as “ Pip, Squeak and Wilfred,” and which included the 1914 Star. Unfortunately there are no surviving service records for Godfrey. The 2nd Essex regiment were part of the 12th Brigade of the 36th Division and they arrived in France in time to provide infantry reinforcements at the battle of Le Cateau, the divisional artillery, engineers, field ambulances and mounted troops being still en route at this time. The 2nd Essex were in action at the Battle of the Marne, The Battle of Aisne and the battle of Messines in 1914. According to the battalion war diary, the 2nd Essex were at Le Bizet throughout February 1915. This was near Ploegsteert Wood as an entry in late January refers to the wood being on their left near the 11th Brigade . “ Feb 17th- Quite a good day. At one time- 3.30 pm the Germans shelled the usual potato patch in the field behind battalion H.Q. and our artillery replied on the hostile trenches. Soldiers Effects state that Godfrey was killed at Le Gheer, which was east of Ploegsteert. The sole legatee was his foster mother Annie. Calvaire (Essex) Military Cemetery, Hainaut, Belgium.